The Interoperability Committee, referred to as IO, coordinates and integrates the recommendations of workgroups, subcommittees and project teams for development of the specification. 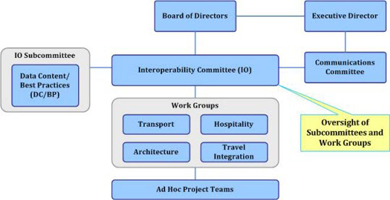 In doing so, the Interoperability Committee assists in establishing priorities for each workgroup, subcommittee and project team and recommends timetables to the board of directors, determines the content for the specification, decides upon the documentation necessary for completing the specification and delivers the specification to the board of directors for approval prior to distributing to the membership and public for review. The Data Content Best Practices Committee provides schema support to the Interoperability Committee, including maintaining a codelist and naming convention guideline, reviewing and harmonizing new elements, attribute groups and messages, and creating new element names for cross-industry use. Project teams are formed by members to address specific functional work and are created within the corresponding work group. The workgroups review project proposals and recommend their approval to the Interoperability Committee. Work groups review all project team output during the course of the publication cycle, and report progress to the Interoperability Committee and the OpenTravel Board.